Children are fascinated with boxes for a simple reason…the inner contents are a surprise until the box is opened! For teachers, boxes and other closed containers offer unlimited possibilities to catch and keep K – 5 kids’ attention. Not every corner of the world celebrates Valentines Day, but on the eve of the popular celebration of love and friendship, picture this blog as a box full (not of chocolates) of options for attracting attention with boxes. The box in my blog pic below collects answers to Fun Zone questions about math that entertain and educate. You can use similar boxes to help kids start the day in a positive way. Boxes with lids and slots attract attention. Set Out a Worry Collection Box – In dozens of schools where I have taught, I’ve heard teachers remark on how effective it is to make time at the start of a school day for students to vent. We all need to do that. The trick is to create a manageable tool that allows kids to, if you will, drop their worries at the door into class so that they can focus on learning. If you don’t have time to personally interact with students who walk in with a look that screams, “I’ve got troubles on my mind,” invite your whole class to drop a note expressing their current worries into the Worry Collection Box. All you need is any box with a lid and a slot on top. Set the box on a table with slips of blank paper and pencils nearby. Suggest to your class that they jot down their current worries in a few words and drop the slip in the box for your later reading. Promise that they may write anonymously if they choose to do so but that any signed slips will be privately responded to by you. It’s a little extra work, of course, but the rewards should show in student attention spans. Let Kids Tell Their Troubles to Rosie or (Insert your pet’s name) – Online (or in store) poster printers can magically blow up any image to life-size. Rosie doesn’t look big in my blog pic here but in real life she’s about 42 pounds of love. Of course we can’t bring our dogs to school unless it’s a service or therapy animal, but we can find a special place in class to set up a large picture mounted on a cardboard backing that will stand up. Place your pet photo in as private a space as you can find and let kids visit with the pet during a few minutes of free time before the morning bell rings. Create a Quiz Bulletin Board & Answer Box – The box in my blog pic above was actually in the media center of one of the schools where I recently taught. 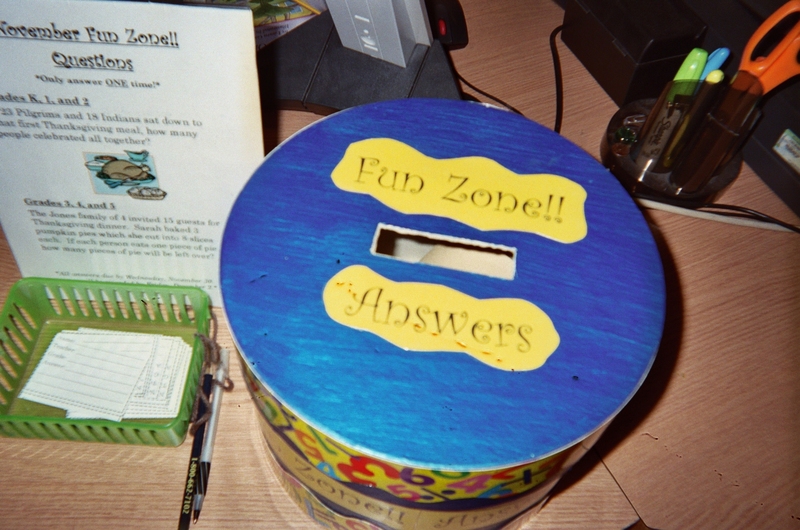 It was the collection box for answers to a “Fun Zone” Math Quiz that was posted on a bulletin board along a well-traveled school hall. Directions for participating in the quiz were posted on a sign next to the answer box. 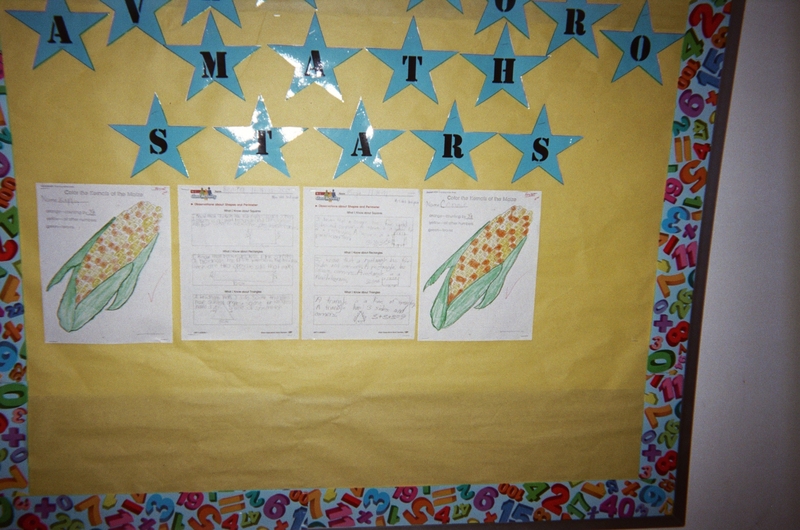 The quiz questions were designed for students in grades 3 – 5. Kids were invited to stop by the media center and drop in their answers over the course of a week. The quiz winners received prizes. The media center specialist reported strong participation. No question – boxes (and eye-catching bulletin boards) attract attention. ‹ Good Work – Good Luck! 2 Pings/Trackbacks for "Box Tricks Attract Attention"